Antique Brunswick pool tables are a beautiful example of workmanship for your Victorian themed game room. John Brunswick began as a carriage builder in Cincinnati, Ohio in the early 1800s. He was well known for his attention to detail and the quality product he produced. When, in 1845, he saw a billiard table for the first time he was fascinated with the design and detail. Brunswick felt he could create something similar but with a higher quality and he set out to do so. He began to create intricately carved and beautiful pool tables that evolved into the largest billiard company in the world by 1850, just five years later. In the more than 150 years that Brunswick has been making pool tables there have been many styles and changes. The Brunswick Cabinet No. 3 made use of the wasted space beneath the pool table. Not only was it a beautiful piece of furniture; but, it had cabinets which could be used to store a variety of items. It had egg and dart molding and Doric caps. Made in mahogany or walnut, this was a very elegant, classic pool table. This table was manufactured in 1894. The Challenge was made from 1892 to 1905. It was a classic table with minimal decoration, in keeping with the Mission style that was just coming into vogue at the time. The Elizabethan was manufactured in 1926. It was very medieval in detail with heavy details and deep carving. One of the most interesting styles is the Home Comfort, made for the middle class in 1908. This was a smaller-sized table that could be quickly converted into seating. It had cast iron legs that were shaped like lions. This remarkable table is one of the most sought after antique tables because of its lavish decoration and unique beauty. Here is an actual image of a restored Monarch table. The St. Bernard Mission table is the epitome of Mission style that was so popular in the early 1900s. Produced from 1892 to 1905, it has the chunky southwestern Mission style and primitive carvings. If you are looking for a vintage Brunswick pool table you may have to be patient. It may be awhile before you find one at your local antique shop. You can, however, often find these tables on the Internet. You will need to be prepared to pay a hefty shipping cost, but you will own a fantastic antique pool table. 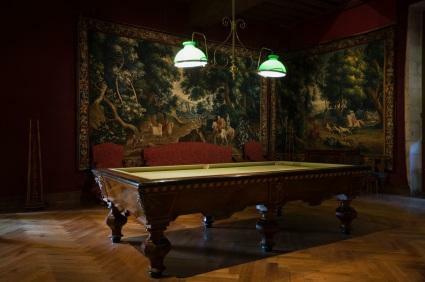 Billiard Restoration carries antique pool tables of all kinds. They also restore them. Antique Billiard Tables carries a large selection of antique pool tables and accessories like billiard cues. Classic Billiards carries several types of antique tables that were built from the 1870s to the 1950s. They also carry custom accessories and do pool table restoration. If you want an antique Brunswick pool table for your home you should expect to pay premium prices for it. For a Brunswick table you may easily pay $20,000 or more for a table that is in good condition. If you can afford one of these tables it will easily be a wonderful heirloom that retains its value.